Can player B touch the ball in any of these situastions? The ball is traveling to the opponents field after receive. Setter A is close to the ball. Blocker B is not putting their hands over the net in any of these situations. 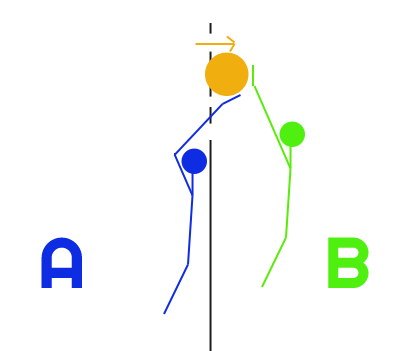 As such, B is perfectly entitled to play the ball as shown in both your diagrams. 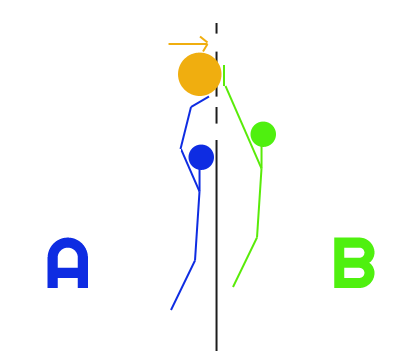 In your top diagram, A is also entitled to play the part of the ball which is on their side of the net - this could lead to a simultaneous contact which is covered by Rule 9.1.2 if you want the details. A player touches the ball or an opponent in the opponent's space before or during the opponent’s attack hit.